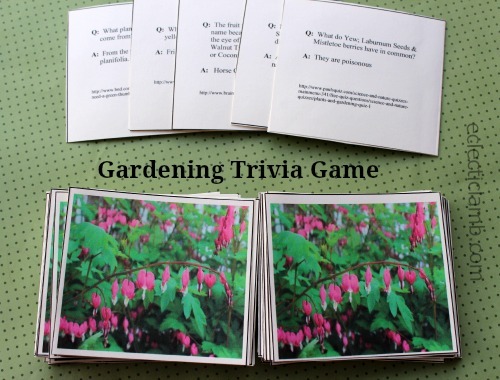 I created this Garden Themed Trivia game similar to my Tea Party Trivia Game. You can print (cut and glue or tape) these and use them at a party. There are 59 cards in this set. The photo on the cards are my bleeding hearts from last year. I made this game for my garden club to use at our tea party this year. We had a group of 23 play this game. There was a lot of laughter during the game. 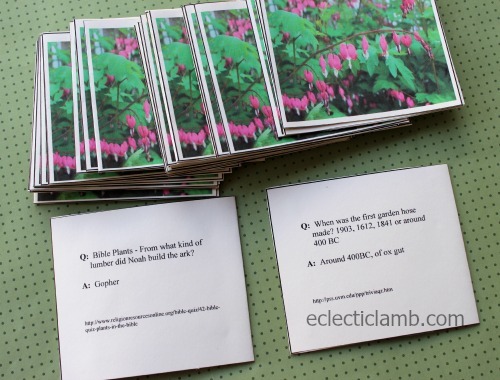 I created some trivia cards with Bible plant questions because I thought it would fit my audience but in fact only 2 players were biblical scholars. Of course you can omit those cards if it does not fit your audience. Disclaimer: I do not guarantee the accuracy of the trivia. I did not paraphrase every card. I included a link to the website where I found the information and/or the question. If there is not a link the trivia was created from my own knowledge. This entry was posted in Crafts, Party Planning. Bookmark the permalink. A great idea for your gardening tea party. I went through many of the trivia questions – many were very difficult!!! Your photo is beautiful – all in all a great job!